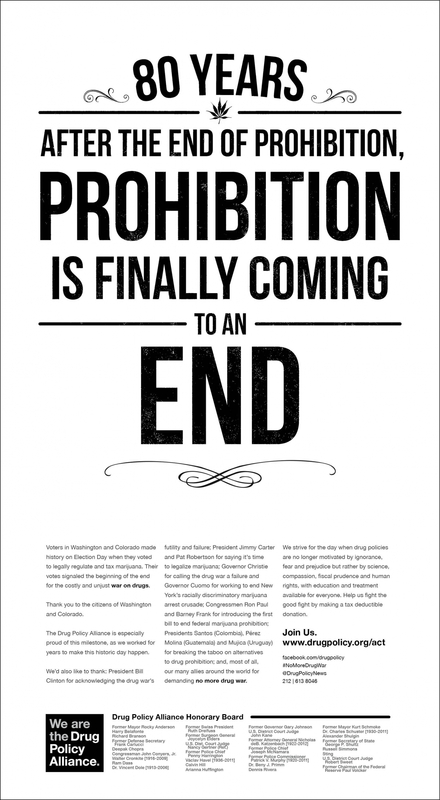 Full Page New York Times Ad in Thursday Paper: "80 Years After the End of Prohibition, Prohibition is Finally Coming to an End"
In Thursday’s New York Times, the nation’s leading drug policy reform organization is running a full-page ad that thanks voters in Colorado and Washington and emphasizes the growing support for drug policy reform among people from across the political spectrum who are renowned for their leadership in law, health, business, media and politics. Last month, Colorado and Washington became the first two states in the country – and the first political jurisdictions anywhere in the world – to approve legally regulating marijuana like alcohol, with both states’ initiatives winning by decisive margins. Even before the votes in Colorado and Washington were counted, 2012 had already been a watershed year for the burgeoning movement to end the war on drugs. Arguments that were articulated just five years ago primarily by intellectuals and activists, and three years ago by former presidents and policymakers, are now being advanced with growing sophistication and nuance by current presidents in Latin America and a small but growing number of elected officials in the United States. In Latin America, presidents such as Juan Manuel Santos (Colombia), Otto Pérez Molina (Guatemala), and José Mujica (Uruguay) are embracing alternatives to prohibition. In a sign of the shifting political tides, two U.S. governors from opposite sides of the aisle who are often mentioned as 2016 presidential candidates – New York’s Andrew Cuomo and New Jersey’s Chris Christie – have embraced drug policy reform this year. Gov. Christie broke ranks with fellow Republicans by calling the drug war a failure, while Governor Cuomo committed to ending New York’s racially discriminatory marijuana arrest crusade. Even strange bedfellows like evangelical leader Pat Robertson and former President Jimmy Carter spoke out in support of legally regulating marijuana this year. And perhaps most tellingly, President Bill Clinton joined several other former presidents in sharply criticizing the war on drugs in the just-released documentary Breaking the Taboo. The ad appears just one week after President Obama commented on the marijuana legalization votes in Colorado and Washington – framing the conflict between federal and state law as a question to be resolved and stating that people who use marijuana in states that have legalized it should not be a "top priority" for federal law enforcement. The Drug Policy Alliance (DPA) leads the flourishing movement to end the war on drugs – in the halls of power, online, and in the streets. DPA is actively involved in the legislative process and seeks to roll back the excesses of the drug war, block new, harmful initiatives, and promote sensible drug policy reforms. As a result of their work, hundreds of thousands of people have been diverted from incarceration to drug treatment programs, hundreds of thousands of sick and dying patients can safely access their medicine without being considered criminals under the law, and states like California have saved more than $2.5 billion by eliminating wasteful and ineffective law enforcement, prosecution and prison expenditures. DPA and its lobbying arm, Drug Policy Action, were deeply involved in the Colorado and Washington initiatives – providing roughly one-third of the funding for the Washington initiative, while in Colorado they were deeply involved in the research, drafting, funding and on-the-ground campaign.